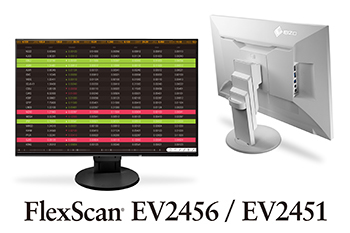 Hakusan, Japan, October 20, 2016 – EIZO Corporation (TSE: 6737) announced the release of The 24.1-inch FlexScan EV2456 and 23.8-inch FlexScan EV2451 monitors for business environments such as trading rooms, back offices and control rooms. These monitors feature a frameless design around all four sides. In addition, they come with EIZO’s newest and most advanced ergonomic stand to maximize viewing comfort. The native resolution is 1920 x 1200 for the FlexScan EV2456 and 1920 x 1080 for the FlexScan EV2451. Both monitors use an LED-backlit IPS (in-plane switching) LCD panel with 178° viewing angles and 1000:1 contrast ratio. The typical brightness is 350 cd/m2 for the FlexScan EV2456 and 250 cd/m2 for the EV2451. Newly-developed EIZO proprietary software called Screen InStyle lets users adjust the color, circadian dimming, and power settings of the FlexScan EV2456 and EV2451. The settings can be applied to all monitors in a multi-monitor setup eliminating the need to adjust each monitor manually. A server application for Screen InStyle allows an administrator to control the settings of compatible monitors in an installation from a central location. This is especially helpful for enterprises that want to ensure all units are adjusted properly and the power-save settings are activated. • sRGB, Movie, Paper, DICOM, and two user-adjustable preset modes. • Overdrive circuit with 5 ms gray-to-gray response time for smooth display of moving images. EIZO (TSE: 6737), which means image in Japanese, is a visual technology company that develops and manufactures high-end display solutions. EIZO integrates hardware and software technologies with consulting, web hosting, and other services to help customers in business, graphics, gaming, medicine, maritime, air traffic control, and other fields work more comfortably, efficiently, and creatively. Headquartered in Hakusan, Japan, EIZO has R&D and manufacturing facilities in Japan, China, Germany, and the US, and representation in more than 80 countries.